What is Gypsy Caravan Tribal Bellydance®? Moving your body just plainly feels good— gets the blood moving, the heart pumping, the joints juiced up…and brings you right into the moment—the be here now factor! When you move and dance, it strengthens the body, tones the muscles, and loosens you up, releasing tensions, aches, thoughts, whatever needs to go. Plus it is super energizing—oh yea. 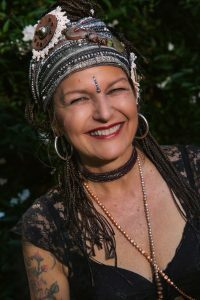 This Gypsy Caravan Tribal Bellydance® signature styling is an eclectic, invigorating, and elegant fusion based on urban, folk, ritual, trance, bellydance, and modern dances. With a background in classical dance training, I have created this rich blend of contemporary movement, based on our common non-verbal language and group improvisation, which is aesthetically pleasing, spiritually grounding, and physically rewarding. Retreats and Challenges coming to you! 2 giveaways for you! Deadline soon…. Desire to step up into your dance? Dance and Desire Ecourse about to start!